As we approach the holiday season, it’s time to reflect on how to make a real impact in the community. 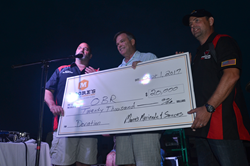 As part of their second annual #MooreHelp campaign for Operation BBQ Relief (OBR), Moore’s Marinades & Sauces (http://www.mooresmarinade.com/) is proud to have raised $20,000 to support the organization’s cause – reaching its goal and plus some! A not-for-profit that provides hot meals to areas affected by natural disasters across the United States, OBR truly lends a hand to those in need. This year, Moore’s pledged to donate 10 cents for every bottle of marinade or sauce purchased during May, June, September and October. With a goal to raise awareness about OBR and help educate communities across the nation of the impact it has on the lives of those affected by disasters, this generous donation directly impacted OBR’s hurricane relief efforts in Texas and Florida. With the tragic devastation from Hurricane Harvey and Hurricane Irma, the team behind OBR was on the move serving BBQ meals to disaster victims and first responders. In less than three weeks, OBR served more than 437,860 hot BBQ meals! Knowing full well what OBR can accomplish, Moore’s is honored to support these relief efforts and bring increased awareness to people across the country. To learn more about Moore’s Marinades & Sauces and their partnership with OBR, visit http://www.mooresmarinade.com. Operation BBQ Relief was founded in 2011 and is comprised of a Disaster Response Team of over 4,420 volunteers and competition BBQ teams. Operation BBQ Relief is able to quickly mobilize its deployment teams to any area across the country to provide hot BBQ meals, compassion, hope and friendship to those whose lives have been affected by disasters. For more information, visit http://www.operationbbqrelief.com. Moore’s Marinades and Sauces began over 30 years ago at a family-owned steakhouse in the small Alabama town of Jasper, and quickly became a staple throughout the South for its delightful, hickory taste. Since then, Moore’s has expanded its line to include a number of mouthwatering favorites like the award winning Moore’s Buffalo Wing Sauce. The full line of marinades and sauces can be found in retailers throughout the nation. For more information, visit http://www.mooresmarinade.com.